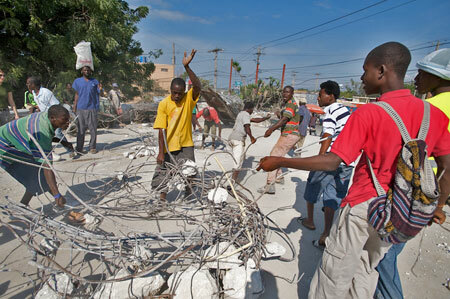 “My buddy who’s in town with Fox wants to know why Haiti looks exactly the same as after the quake,” my Haitian friend texted me the other day. My driver, Sam, has expressed a similar assessment about the lack of progress. 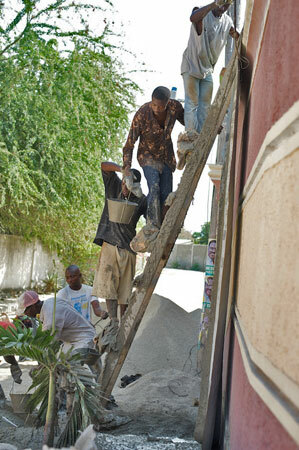 But driving around Port-au-Prince today, there was all sorts of rebuilding under way. Take, for example, Fort National, an area that’s a little ways up a hill and is covered with destroyed structures: crumbling cement-block frames, exposed rebar. The government announced on TV the other day that they’re launching a giant rebuilding project, lots of apartments you can move into and rent to own. The pictures of what it will all look like when it’s done are very impressive. But they haven’t started yet. Okay. A better example is the First National City Bank, a giant ruined structure that used to take up a corner of a busy intersection but is now an almost entirely cleared lot. A Caterpillar bulldozer breaks up the remaining large pieces, with about half a dozen construction workers and 10 scrappers to every one of them. 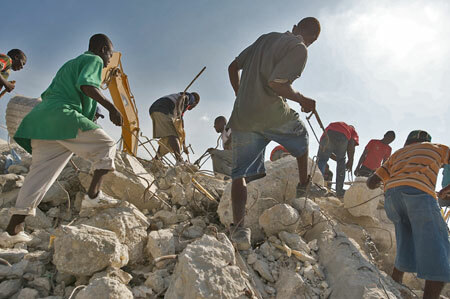 The workers destroy another chunk; the scrappers swarm quickly with saws and little sledgehammers to pull out sellable bits in a chaos of dust and sharp edges. Makelo, a 29-year-old with an armful of rebar, says he makes way more money—several hundred dollars a week—than he did before the quake, when he sold charcoal. 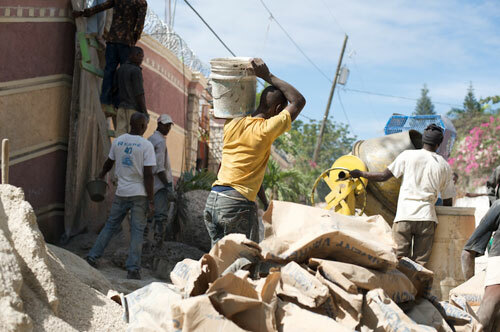 Our conversation halts when a fight breaks out among some scrappers, who are pushing and shoving over a newly smashed, potentially lucrative block of building, and the workers start pushing and shoving them away from the lot. “We shoo them away because this equipment is dangerous and sometimes people get hurt or killed,” says Etienne, the 28-year-old site manager. “They shoo them away because they want to keep the good scraps to themselves,” Sam says. There is fresh blood on the ground near my left foot. Nearby, workers are filling in the concrete frame of a big building their boss says will be done later this month. Three apartments on top, several storefronts on the bottom. What stood here before has been completely demolished, and they’ve been working on this for a couple of months. It’s supposed to be done at the end of the month, at a total cost of about $70,000. A little further up some winding roads beyond the heaviest bustle of the city, in Vivy Mitchell, there are crews everywhere, too. Fixing stone walls around recently fixed houses, building a house where a broken house was just torn down. The prevalence of rich people’s development versus the total lack of it for the poor is pointed out to me again later. In response to my description of what I saw, even a wealthy person at my hotel gives me the kind of look that one might level at a particularly disappointing child. “That’s all private-sector rebuilding,” he says. “That’s to be expected.” And you cannot, and would not ever, deny that the work needs to be bigger and harder and faster. There are still a million people in tent camps. “Still, it looks better than it did in September,” I say.